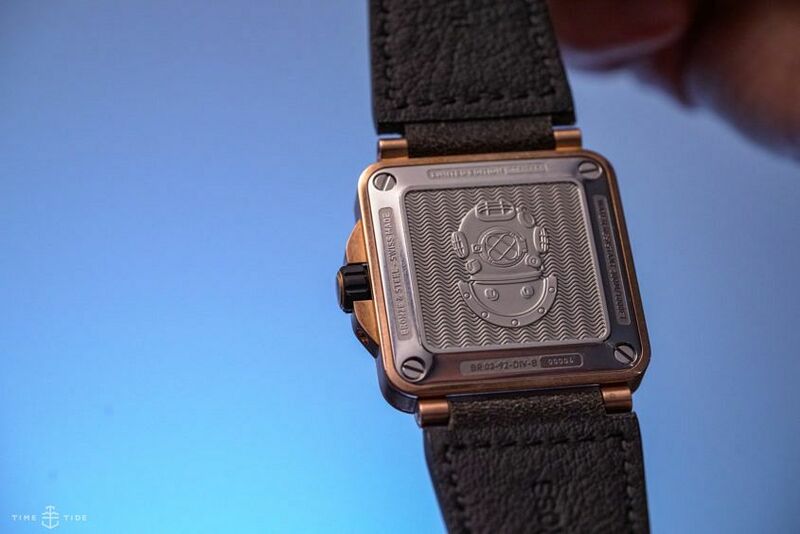 While Bell & Ross are well known for their aviation-inspired designs, there’s another side to the French watch brand that takes them from the flight deck to the boat deck. A side that saw them introduce their first ever dive watch in 1997. The oil-filled, and more round than square, Hydromax — with an unbelievable water resistance of 11,100 metres. It’s also a side that last year welcomed their first ever square-cased dive watch, the BR 03-92 Diver. Beginning a collection, that for Baselworld 2018, grew by two. 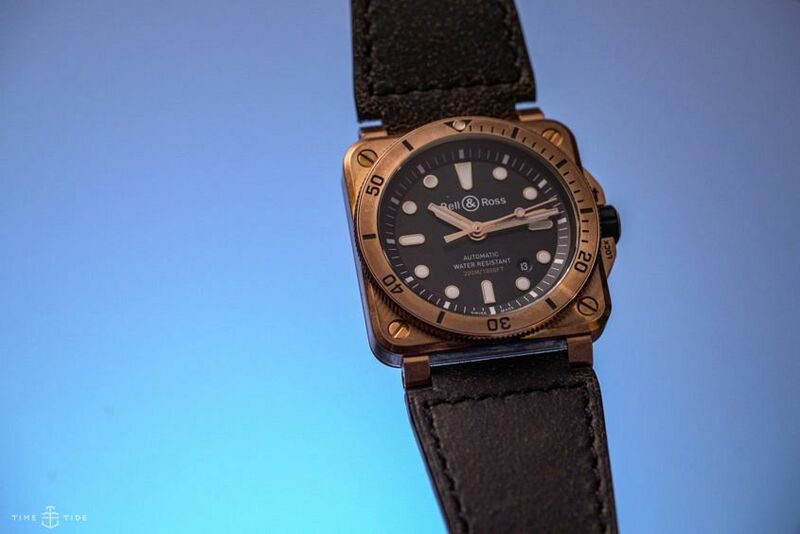 One of which is the brand new BR 03-92 Diver Bronze, which, as the name suggests, is all diver and all bronze. Updating the colour and material of last year’s BR 03-92, this new version features a black dial with gold-plated indices and hands, as well as a 42mm x 42mm square case that’s constructed from a chunk of satin-polished CuSn8 bronze. To match the case is an all bronze – without aluminium insert – unidirectional rotating bezel with 60-minute scale, and proud crown guards that flank a black rubber-coated crown. 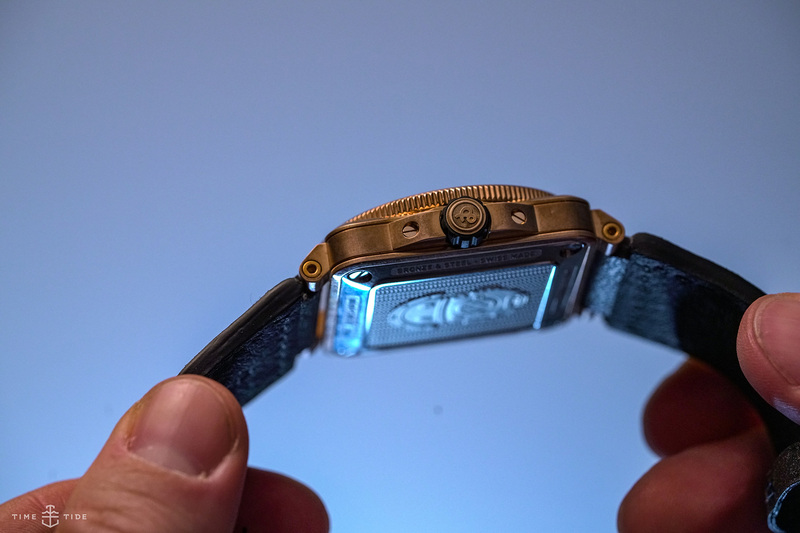 Water resistance is kept at 300m, while inside is the same BR-CAL.302 movement – based on the automatic Sellita SW300 with a power reserve of 38 hours. And like the previous version, this four-sided diver means business, maintaining (and exceeding) the ISO 6425 safety standard (the criteria that defines a true dive watch). Finally, to pair well with the bronze case as it patinas over time, is an aged brown calfskin strap; while for diving, also supplied is a black rubber strap. Anyone who is familiar with square cases will know that you can’t always go by the numbers. With the 42mm dimensions of the BR 03-92 Diver Bronze covering a greater area than that of an equivalently sized circular design. Still, despite its increased wrist real estate, and thanks to short lugs, the square bronze diver wears quite comfortably – in a very much “ready for action” kind of way. This isn’t your one and only watch for all occasions. But more your “get the job done while making it your own” kind of watch. It’s one that’s perfect for a weekend warrior and most definitely the underwater explorer type. I think I’m still getting over the surprise of last year’s BR 03-92 Diver — I’d never thought of a square-cased dive watch before. And I’m slightly embarrassed to say that this bronze version has done it again, especially because it just makes perfect sense from the square-case masters of material. 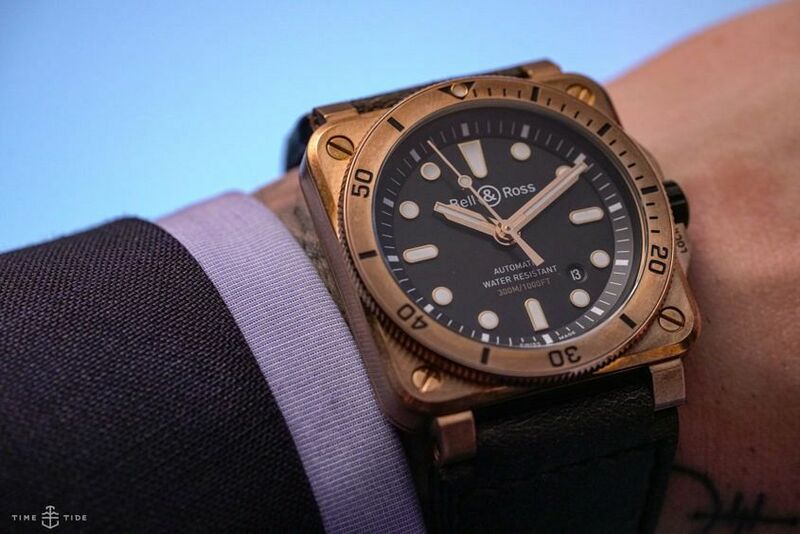 The Bell & Ross BR 03-92 Diver Bronze, limited to 999 pieces, $6600.